Two great games and one bad one, but it's hard to get too excited about this trilogy. When I was 18, I had enough time on my hands that I could finish Devil May Cry 3 eight times, mastering the different weapons and styles. 12 years later, my hands hurt after twenty damn minutes of this game. 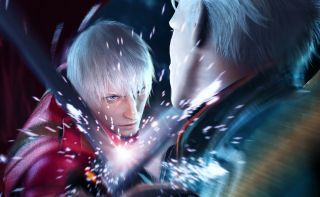 This collection brings the PS2's first two Devil May Cry games to PC for the first time, along with the third entry, which was previously the subject of an apparently dire port. These action games were the best of their kind back in the day: challenging and exciting hack-and-slashers with enemies that often required careful and precise actions to beat, and a protagonist, Dante, who was oddly cool in a deeply '00s way despite his ludicrous dress sense. This collection is pretty basic, and at £25/$30 feels like it costs more than it should, especially considering that Devil May Cry 2 isn't worth playing at all, and that you can buy Bayonetta—this series' more recent and triumphant spiritual successor—for just £15 on PC. It's tough for 3D games with this colour palette to age well. What you get is each game running at 60fps, additional resolution options, anti-aliasing, key remapping options...and that's it. The intro menu is particularly cheap-looking. This collection also distractingly switches from 4:3 menus to widescreen when you're in-game—this isn't a huge issue, but it does suggest that little love has gone into this version. Any cutscene that isn't presented in-game looks blurry and bad, too. Next to the recent remaster of PS2 classic Final Fantasy XII, this feels like a lesser effort. That said, I'm not totally down on the idea of owning this collection, because DMC and DMC3 hold up well, even if they haven't received much of a facelift—especially the third game. In a Steam sale, this would be a totally acceptable purchase for completists. 2001's Devil May Cry began life as an offbeat Resident Evil sequel, and the DNA of the series is still here in the castle setting and key-heavy puzzles. The enemy designs—which feature creepy wooden puppets coming to life—are fantastic, and while DMC3 features more animated, varied and exciting action, this is still a perfectly fine version of this type of game. Devil May Cry 2 is a misstep. The action isn't vastly different to the first, but the enemy types are less interesting, and it's strangely easy. Its biggest crime, though, is abandoning the cheeky tone of the first game in favour of dour cutscenes, making it feel like a boring knock-off sequel. The opening cutscene of DMC3, where Dante kills demons while eating pizza, remains a firm favourite. I love Devil May Cry 3. Bayonetta has surpassed it with its selection of combos, super-refined combat and imaginative weapons, but DMC3 is still terrific fun—and by far the highlight of this collection. Capcom's team responded to criticism of the second game by leaning further into the first entry's cheeky tone, with cheerily daft cutscenes and a weapon that doubles as an electric guitar. It's still really enjoyable, and you also have the option of playing as Dante's brother, Vergil. You'll never be in any doubt that you're playing some old PS2 games, though, with the trilogy's muddy textures and ancient character models. Compared to Okami, a game of a similar era, this darker art style hasn't aged nearly as well. For anyone who wants to pick up a contemporary Devil May Cry game, try the vibrant DmC from Ninja Theory if you haven't already. I couldn't click with DMC4's new protagonist and his combat style in the same way I did with Dante. It's hard to get too excited about this collection as a fan, then, but it is nice to add three more old favourites to my needlessly overpopulated Steam library—even if they could've been treated with a lot more reverence by Capcom. DMC2 Dante was a boring man, but hot damn he had a good coat.